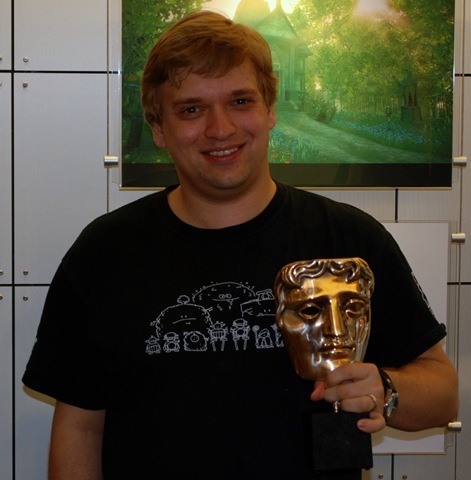 Lionhead won best Action & Adventure Game at the BAFTAs! I get to say I have a credit on a BAFTA winning game! It makes me even more proud of the team and feel very fortunate to be among their number. 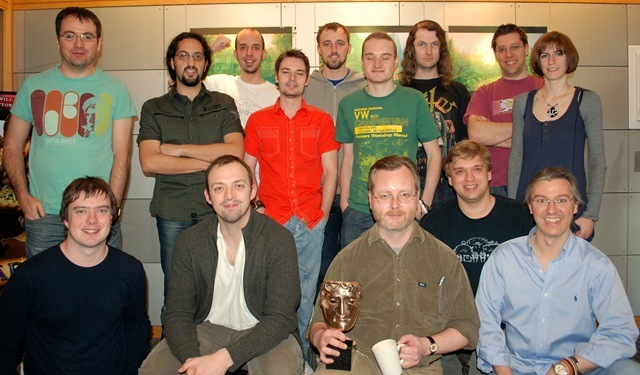 A few days after the awards I organised some of the team together to pose with the BAFTA. Many thanks to Louise for letting us borrow it for the shoot! Gave me a chance to use my Nikon D80 SLR for something pretty special. 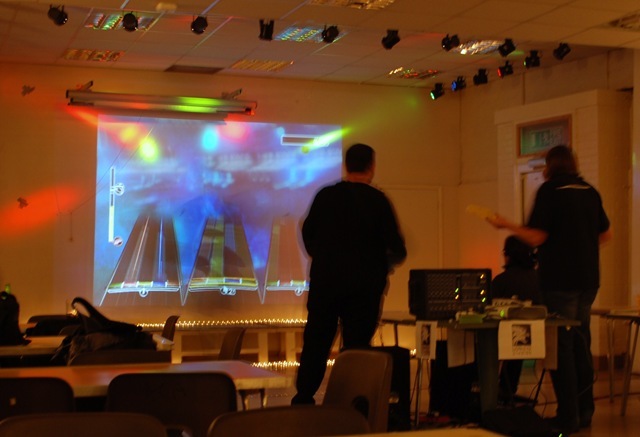 I organised a party for Lionhead family, friends and ex-pats back at the end of February. The night went really well thanks to my wife doing a ton of leg work for it, the Lionhead band organising themselves and a ton of attendees contributing kit for the evening. I felt it was important to have an event to thank the friends and family who supported all of us during the later part of the development of Fable II. Although they didn’t work directly on the game their contribution was invaluable. 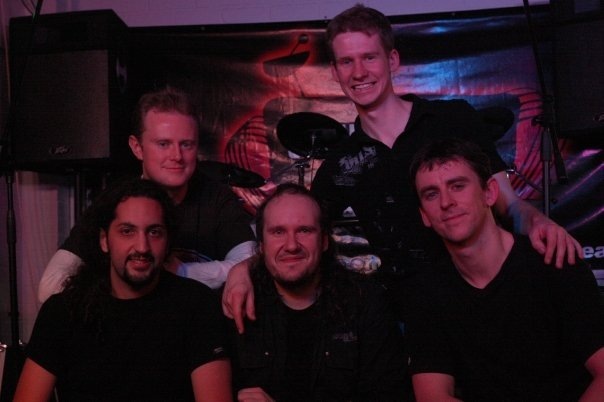 The highlight of the evening was with out a doubt the Lionhead Band and their great set on stage. 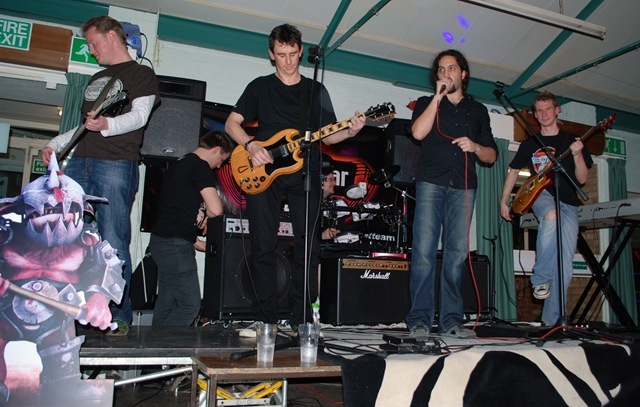 It was their second gig – they were called in at the last moment to provide entertainment for the Christmas party. Luckily they were already practicing for the unofficial party and I hear that first performance was great (I was visiting the States at the time of that Christmas party). I have read a few blogs recently about the industry, how the authors got in and what they think about what is going on right now… I figured I would add my voice to the discussion. The news is full of stories about so many closures and layoffs everywhere and the games industry is not immune. Studios are shedding jobs through publishing deals falling through, bills not being paid or a change of focus and direction. I am acutely aware of how fortunate I am being employed in times like these. Some companies are quite well known for a high level of churn, especially during the final stages of shipping a game and straight after. Some of this is natural – people leaving for new opportunities of their own choice and looking for a change or promotion. Others have contracts that are due to end and do not get renewed – where as this is difficult for the employee at least it is predictable and they can look for work in advance and perhaps have a financial plan in place. Salaried employees not expecting the chop, contracts terminated prematurely… those people have it the worst. When you are unexpectedly on the job market, there are all kind of pressures that wouldn’t exist if the move was your choice – least of which might be competition for a position with a former colleague. Staff with experience are harder to come by though, and job descriptions for all but the most junior positions seem to expect it. Some programming jobs do put game industry experience down to preferred rather than required. A high rate of churn means many transient candidates in the recruitment talent pool – it is probably easier to get hired elsewhere at a higher level than to get internally promoted at many companies. Indeed for an open senior position, it may make sense to hire someone from outside because they are proven in the role or because the company has money for the new hire-possibly due to this coming from a different budget from the promotions budget. The company knows that they have someone in the wings capable of the title, but may not be likely to reward that position or money to the individual in question while they are content to stay in their current role. I have only been in the game industry for just over two years – I came over from the business/government software sector where I had worked my way up to being the lead programmer on a few products. Ever since I was a little kid I had always wanted a credit on a game, so I did not pass up the opportunity to move in to the industry when it came up. I’m proud to say I have achieved that ambition – not just on any game – but a successful game. I worked on a bug here and there for Fable II, but my aptitude and experience from my previous life meant I was employed as part of the tools team. Working on the tools team might not be a glamorous part of the process, but it still can be very rewarding. Your customers are internal and you can immediately see when you improve their day. As far as career structure goes – I think many software engineering roles in games or business software sometimes require you to jump ship and move around from time to time. Indeed some of the most senior people at Lionhead have moved around pretty frequently before settling there. People who have left Lionhead tend to do well – a “standard” programmer left recently to become a technical director elsewhere – quite the career leap. The Media Molecule guys are also prime examples of excellent alumni – setting up their own company and publishing a game that garners so much critical acclaim is an impressive feat. Owning or being a partner in a company is something I see for myself in the long term future. Having your own future in your hands is appealing because although there is relative safety working for someone else responsible for you getting paid – it does not stop a decision high up in the chain of command resulting in your job position being eliminated. I do not want to leave Lionhead anytime soon though – I feel I have much more to give to the studio – the skills and experience I have are uncommon in the games industry. For those wanting to get in to the industry despite how turbulent it seems to be – my advice would be to pick something to specialise in and be able to demonstrate it in some way. For students, remember that university is a game itself – where often the grade is the first thing people notice, then the subject and the institution it came from. When you are starting your university programme, think seriously about what goals you hope to achieve from your course. What are your strongest skills? What skills do you feel you have the most potential to develop? What are your biggest weaknesses? Make sure you choose a mixture of options which help you to maximise your strengths, develop the areas you know will benefit you the most, and challenge the weaknesses without destroying your final grade. Do not over commit yourself trying to face subjects addressing the areas where you are least capable – keep this in mind especially in the final year when choosing your dissertation / final year project – there are going to be many pressures on your time. While it is important to build those areas up, it is just as vital to be the best you can possibly be at the things that come more easily to you. It is important to dedicate personal time to build up your own portfolio so you have something to show other than university course work. As for picking the degree itself – if you are a programmer a games degree might not necessarily be the best thing – a good computer science / math degree plus being able to show your own side projects might put you in an even stronger position. A traditional degree adds flexibility to your career too… if the games thing does not work out you have a good basis for plan B. Just as I have made the leap over to games, I have known some game developers that have migrated over to business and banking software. Every day I come in to work I see something new and inspiring – and to be in the company of such talented and visionary people is an honour. Being here and learning from those around me is good for my future, and no doubt will open up opportunities for me later on in my career.